Does Anyone Believe Michael Robertson Anymore? So, why did Robertson sue his own bank? When I was CEO, I decided to make some shifts in the company's product line strategy which required letting some employees go. These were wonderful, hard-working, committed, trusted, long-term employees, most having worked for Linspire for around five years. These had been some of the most key individuals for Linspire over the years, including our lead OS engineer, the Director of the OS, and other employees and executives. It was unfortunate that we needed to let these good people go, and I felt the least we could do was give them fair and reasonable severance to ease the blow. After all, it was these very same employees who had just helped Linspire turn in an extremely profitable year. Their good work had allowed us to pay off all of our debt and still have millions of dollars in the bank (which some shareholders believe Robertson took and/or squandered). At a minimum, I felt it only fair to use a very small portion of that year's profits to pay them a respectful severance. I wanted to treat these employees with respect and fairness. I knew by treating these long-time employees fairly, they would be happy to continue to help us if called upon (as departing employees so often are). That's how I felt anyway. Michael Robertson, however, being the greedy man that he is, originally wanted to see these good people terminated with only two weeks severance. After a week of arm twisting, he suggested slightly more, but still less than I felt what was appropriate. Fortunately for these employees however, Robertson had no operational or executive role at Linspire (he played absolutely no role in the huge profits we brought in that year), and it was up to me as the CEO to set the severance amounts for any laid-off employees. So, contrary to Michael's suggestion, I laid the employees off with the reasonable severance amounts I felt were appropriate, totaling only a few percentage points of the huge revenue and profits these employees had brought in that year. Prior to every action I took, I consulted with outside counsel to ensure that everything I did was proper and within the scope of my authority. Do not do your proposed reduction in force. Please focus all of you energies on getting the new products to market at this time. Translated, I took that to mean: "Hey, before we stick the knife in these employees' backs and fire them with a few measly weeks of severance, let's abuse them one last time. Don't tell them anything about the pending layoffs just yet, but rather, keep them slaving away for a few more days until we get CNR.com and the new version of Linspire out and THEN you can fire them." I hereby offer my resignation, effective immediately. After six years of quality service as President, and two years of having also been CEO, it is apparent that you are no longer willing to let me function in ways I see best for the company. Since closing on [recent lucrative deals], you have tried to challenge me and my authority as CEO and attempted to override my judgment with decisions which I do not believe to be in the best interest of the company and its shareholders. To facilitate a smooth transition, please contact me as soon as possible so we can discuss and coordinate how to best message my resignation to employees, customers, the press, [partners], etc. President & CEO, Linspire, Inc. I further told Michael that I didn't want one dime in severance for myself. I just wanted to be done with Robertson's greed, rants and unethical tactics and move on. Michael replied and immediately accepted my resignation. However, he never did meet with me. Instead of coordinating with me a successful course of transition for Linspire with customers, employees, and partners, Robertson set about a maniacal plan to do all he could to take away the severance payments given to these good employees. He tried to reverse the severance payments, but of course the employee's banks refused. He then did the unthinkable. He filed a false report with the San Diego police department claiming that the money I, as CEO, had given these good employees as severance had been embezzled by them! Who does something that insane?!? Because he wasn't happy with my decision as CEO about their severance payments, he calls them all embezzlers??? Michael Robertson ran these employee's names through the mud and did everything he could to get his greedy hands on the employees severance, but alas, to no avail. Two of the employees even offered to give back their well-deserved severance, and Robertson told them it wouldn't be necessary, and yet he continues to this day to call them part of a "criminal conspiracy" to embezzle money from Linspire. After losing his bogus claims with the San Diego police department, the IRS, and the unemployment office, Robertson decided to sue his bank, Comerica, trying to get the bank to reimburse him for the severance payments, claiming that I was not authorized to wire these to the employees. So, yet again, Robertson dragged out his ridiculous claims that these severance payments were embezzlement. Even though I was the CEO, and the payments were authorized by me, Robertson claimed that no one but he had real authority to make these severance payments. Not the CEO, CFO, Controller, etc., no one but him. The rest of us were all just embezzlers. Comerica, also realizing how ridiculous Robertson's claims were, and knowing they were certainly in no way responsible for sending payments instructed by the CEO, filed a motion for summary judgment to have the case dismissed. In other words, they asked the Judge to rule that the case was so groundless, that he kick it out of court and not waste any more of the courts time. Judge Meyer Rules Robertson's Statements as "Irrelevant." 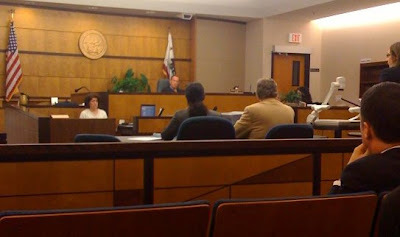 I attended the hearing which lasted only about a half hour, at which the Judge granted Comerica's motion and disposed of the case in Comerica's favor. "Carmony was plaintiff's President and CEO at the time the payment orders were made. Long was plaintiff's Controller. Undoubtedly, both were agents of Plaintiff Linspire, Inc., and were acting within the scope of their agency." "[The] implied powers of a general agent or manager are very broad, embracing authority to do all acts customarily connected with the business in which he is engaged....An agent has authority: 1. To do everything necessary or proper and usual, in the ordinary course of business, for effecting the purpose of his agency..."
"[Carmony and Long] had actual and apparent authority to cause the payment orders to be issued in plaintiff's name." "Carmony's the CEO, and Long is the controller! How can there not be authority?" "Well, I'm not sure I understand. Carmony's the CEO and Long's the controller, and they were at the time of these transactions. How can there be any factual dispute as to whether or not they were authorized agents of Linspire?" The judge's ruling correctly confirms that I, as CEO, had the authority to wire these employees their severance payments. Sadly, even with a judge saying all this in an open-court ruling, I'm sure Robertson will continue with his false embezzlement allegations against these good employees, showing just what kind of unethical person he is. Judge Further Rules Robertson's Statements as "Irrelevant"
As part of their "evidence" against Comerica, Linspire included a declaration from Robertson. Filled with nonsense and misstatements, Robertson basically rants that he was the one with the authority, not the CEO. He claims this because I and the laid off employees were all just a bunch of embezzlers. Never one to let the truth get in the way of a good story or lawsuit, he attempted to re-cast layoffs, private executive meetings, and severance payments as some kind of sinister plot carried out by a group of conspiring embezzlers, continually using such words as "secret meetings" and "unauthorized wire transfers" to describe regular business affairs. "Because virtually all of the substantive statements made in Mr. Robertson's declaration are irrelevant, the Court declines to issue individual rulings on each discrete objection." In other words, I was the CEO, wiring the severance payments was authorized, and Robertson just needs to get over it and deal with those facts. I had told Robertson on numerous occasions and in emails that if he disagreed with how I was running the company, that there were steps shareholders can take to remove a CEO. Those steps were never taken, so I had full authority to give these employees severance, even though Robertson wanted to give them paltry severance for their years of hard work. Our CFO had an employment agreement guaranteeing him two-years of severance should he ever be terminated. I amended that agreement some time ago, all by myself, without any board approval, and removed the 2-year severance commitment. Interestingly, Robertson claims that I didn't have authority to grant severance payments. If this were true, then I certainly wouldn't have had authority to amended our CFO's employment agreement. Perhaps the CFO should sue Linspire to receive those two years of severance? Even if Robertson was legally in the right here (which the court has ruled he wasn't), it would still show how greedy he is and how he treats employees. Regardless of court rulings, the fact remains that Robertson wanted to treat these employees poorly, and when I refused to do that, he calls them thieves and embezzlers to get back at me and them. Does it get any lower than that? It was pretty ridiculous for Robertson to think that the bank would pay him money just because he disagreed with the severance amounts I, as CEO of the corporation paid. It gives you an idea as to the alternate reality Robertson lives in. Rather than running around suing people, perhaps he should just focus on actually building something. I've never sued anyone in my entire life. Have you? *Note: As far as anyone knows (since Robertson isn't talking to shareholders we can't be certain), Michael Robertson is the only employee at Linspire, now called Digital Cornerstone, Inc. So, when Linspire/Digital Cornerstone sues someone, it's Robertson doing the suing. Thanks for keeping us updated with all the behind the scene activity with our formerly beloved Linspire and also about Robertson. He sounds like a real chump. I sincerely admire your sense of ethics. It's great that you had the sense of mind to seek counsel in matters that would infuriate Michael Robertson. This demonstrates that you were aware of the potential problems and took measures to ensure you your actions were not only proper, but backed by the legal system. While I find it disheartening that unscrupulous people routinely get away with their actions, everything they get away with DOES catch up to them, eventually. Thanks for taking the time to keep your blog updated on these proceedings. They're greatly appreciated and I pop in several times per week to check for updates & new material. Have you ever thought about starting another? If a complete baboon like MR can do it...surely someone with your track record, and strong sense of ethics could make it work. I've got my hands full with my new venture, Dating DNA (www.datingdna.com). However, I remain involved via friends at Canonical/Ubuntu. I think they are doing a lot of good things for Linux on the desktop. I'd also like to thank you for keeping us all up to date. Without your blog I probably wouldn't have even heard about this, much less have any idea of what was going on. I wonder how long this will take to actually get resolved? The SCO vs IBM crap is still ongoing after how many years now (and how many rulings against SCO)? I had the misfortune to work with MR before he started mp3 and his even earlier ventures. Some of my friends from SDSC went with him when he left to do mp3. They all got screwed. i'm curious why linspire would fire its top employees near a big launch? Thank you for this excellent article about Michael Robertson's actions at Linspire. I was not completely up to date with the issues at Linspire but I've heard of your company since Lindows and wondered what happened. It is sad that someone like Robertson could ruin a good thing, but c'est la vie. Where do you see Linux profitability going in the future? Do you believe service models will actually work for Desktop Linux? That's why it was important to give them fair severance, so that they would help with the new product launches as needed. Scheduling wise, it was the right time for the layoffs IF they were let go with decent treatment. Any and all of them would have eaten glass for Linspire, even after having been let go, so they would have done anything asked of them to help with the launch. Of course, when Robertson then called them all embezzlers, they wouldn't cross the street to help anymore. When Robertson and I would argue about what the right amount of severance would be, he would say crazy things like "I will not pay people off to say good things about Linspire!" I would try to explain to him that it wasn't about "paying them off," but just treating good people with dignity and respect. Robertson is clueless when it comes to dealing with people in general, and certainly employees. I just finished watching the HBO special, "House of Saddam." If you've seen that, you have a pretty good idea of Robertson's management style. I believe the service model (what Red Hat and Canonical are using) will continue to be the model for Linux. Given that it is open source, the "code" will always be "free," but some users will need more than code, they will need support, web services, etc., and Linux will just be the conduit for such services. OMG!!! I just read this in its entirety. I had always heard Michael Robetson was a real jerk, but wow, he gives jerks a bad name. Very interesting reading. It's nice to read the back channel of what really happened over there at Lindows (Linspire). I never liked Robertson and this is just further evidence as to why. He's one shady character.